All girls love dolls prams and they're certain to love the quality, handcrafted wooden dolls prams available online at Jumpin' Jacks Toys. From the Moover collection of dolls prams comes a modern design that all girls will want to look at, touch and play with for hours. Made from natural birch veneer and featuring wooden wheels with rubber tyres, each of our toy prams are adorable and designed to provide years of use and entertainment. 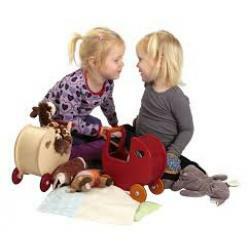 Moover Line Dolls Cradle is an ideal companion for the Moover Line Dolls Pram. We love that the Moo..
Moover Toys’ Dolls Pram is both classic and modern in its design with focus on what children like..